The massive Disney movie, The Lone Ranger hasn't been performing well at the box office - in fact it's done so badly that Johnny Depp should have replaced the Crow on his head with a giant turkey, as the movie looks set to lose Disney well over a hundred million pounds. Pretty shocking stuff for a movie based on a much loved character like the Lone Ranger. 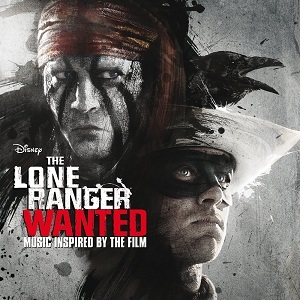 In what cynics will see as a desperate attempt to recoup some of their losses, Disney are releasing two albums - the soundtrack which will contain music from legendary movie soundtrack composer Hans Zimmer, and this album - Wanted, which is described as "music inspired by the film". So, is this album any better and is it worth buying? That's not a simple one to answer. On the one hand there are some really good songs on the album, but on the other I don't see much here that will appeal to the sort of age ranges that will be going to see the film in the cinema, and that's the big problem - without the music appealing to the same age range as the film then the album really isn't likely to sell well. In summary then, this album has some good songs but none that make me think I must rush out abnd buy the album, and it's hard to see who it's going to appeal to.